You may be thinking of adding zest and color to your wedding, reception, hotel room or honeymoon suite but just can’t hit the nail on the head. 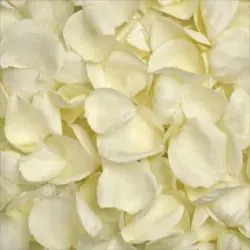 Be innovative and think of using Fresh Natural Rose Petals for adding the pleasant aroma and a soft caressing scent. 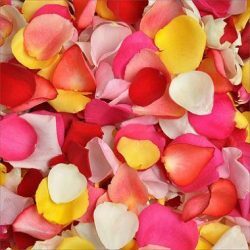 We can provide you with rose petals bag of fresh rose petals to throw around your space and fill it with a pleasant and pleasing aroma. For larger events, we offer 6,000 and 12,000 packages too! The method can be suitable anywhere you want to sprinkle some magic. 1,000 fresh rose petals per 25-30 guests for Rose Petal toss. 1,000 Fresh Rose Petals will fill a large flower girl’s basket or will decorate ten 8 foot tables. A 3,000 Rose Petals bag will give you approx. 12′ by 25′ coverage. Use Fresh Rose Petal to make trails and walkways. We suggest scheduling the flowers to arrive 2 days before your event. Review our Fresh Flower Care link below for helpful information and tips to ensure best performance of fresh flowers. How to Keep Fresh Rose Petals Fresh for your Event Day. · Eliminate moisture from external surfaces of rose petals. Spread the petals out on a paper towel or cloth and lightly pat them with a paper towel or cloth to remove any excess moisture. While the freshest rose petals are full of moisture on the inside, too much moisture on their outsides can compromise their freshness, causing them to become soggy, moldy and discolored. · Line the inside of the petal bag with paper towels to absorb excess moisture from the petals. Store rose petals in sealed bags. 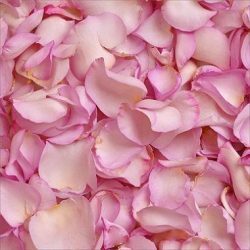 · Keep rose petals in a cool place when not in use. A refrigerator is an ideal location to store rose petals. Make sure the refrigerator is not too cold, which may cause the rose petals to freeze; once they thaw, they will be soggy and discolored and ugly so avoid freezing. Keep the refrigerator above 34F degrees to avoid freezing. All images are from the actual flowers, due to weather conditions and different monitor color settings, the shade may vary to a small degree from product image shown. 1,000 petals per 25-30 guests for Rose Petal toss. 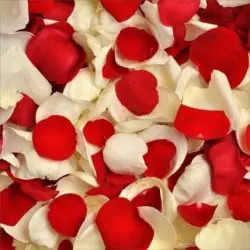 1,000 Rose Petals will fill a large flower girl basket or will decorate ten 8 foot tables. A 3,000 Rose Petals bag will give you approx. 12′ by 25′ coverage. Use Fresh Rose Petal to make trails and walkways.